Cut out twenty 7" squares. If you want to make a bigger quilt, you would cut out more squares. I have four squares across and five down. Then from my shapes on this website, I decided which ones I wanted on my quilt. 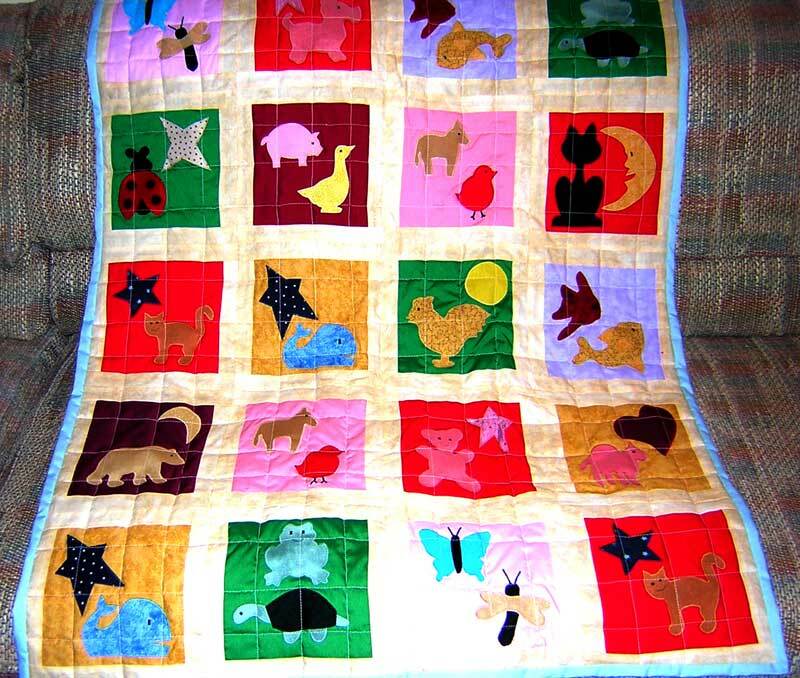 I used mostly animals and bugs for making a little boy's quilt. Now you need to find material for the shapes you are using and put Wonder Under on the back of your material as directed. Trace your patterns on the Wonder Under and cut them out. Iron on the shapes on your 7" squares and sew them on with a medium zigzag stitch. Cut forty strips of a different material then your squares for the edge of the 7' squares. These strips need to be 7 x 1 1/2" for the sides of the blocks. 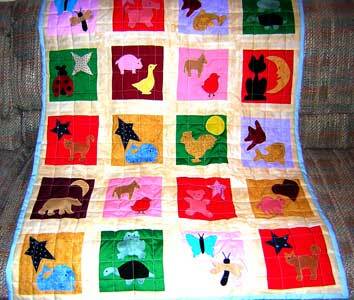 Also cut forty strips of the same color for the top and bottom of the blocks. These strips need to be 9 1/2 x 1 1/2". Sew the strips to each block, all sides first and then the top and bottom. Now you can put your squares in order of your choosing, four across and five down and sew the rows together. You can either put another strip around all the edges after you have sewn the rows together or start putting the batting and backing on. 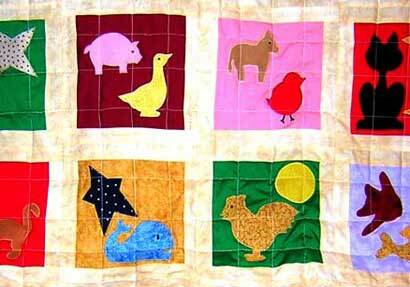 Have fun making this quilt and when you are done, you can start making a little girl's quilt from the shapes on this website.